I have a confession to make. I am a tea drinker; I live in Colombia; and I’m not a huge fan of coffee *GASP! * (although in my defense, this is mostly because it makes me a bit crazy..). However, if you live in Colombia, and PARTICULARLY if you have Colombian family-in-law, you WILL end up drinking a certain amount of coffee! But as your suegra enthusiastically tips it down your throat, how can you really tell how good the coffee is? What’s the quality of the bean? Where was it grown and in what climatic conditions? What other plants, fruits and flowers were growing close to the coffee plant which might have affected the flavour? And which method was used to prepare it before it reached your cup? When Karen Attman from Flavors of Bogota invited me to join her on her Coffee Shop Tour, these were all questions I was curious to know the answers to. Karen Attman moved to Colombia four years ago and started the renowned food blog Flavors of Bogota. 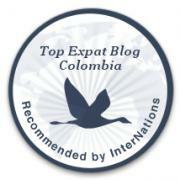 It’s a blog that I regularly consult when I’m looking for inspiration on where to go out for dinner in Bogotá. In time, Karen developed a particular interest in coffee and discovered that, beyond Juan Valdez and Starbucks, Bogotá has a hidden world of specialty coffee shops waiting to be explored! Colombia’s reputation as a coffee-producing nation is well-known throughout the world, so many visitors to Colombia are keen to do a coffee tour. But not everyone has the time or resources to head over to the Coffee Triangle, or to travel a couple of hours outside of Bogota to visit one of the more local coffee farms. So Karen wanted to offer people the opportunity to discover the magic of Colombian specialty coffee, and the art and science behind it, without having to leave Bogotá. Hence, the Flavors of Bogota Coffee Shop Tour was born. The video above will give you a flavour (no pun intended :)) of what this unique tour offers. You will visit coffee shops which offer high quality beans produced by small family-run farms in different regions of Colombia. Each coffee you’ll sample will have its own unique flavor profile, as every coffee shop has their own special way of preparing the coffee. One of the shops we visited on the tour even had its own laboratory! Fernanda, a barista at Amor Perfecto, prepares the Hula Barrica coffee, which is stored in Cabernet Sauvignon wine barrels from the Pedro Toro vineyard in Villa de Leyva. As you slurp the coffees (very important to slurp!) Karen will be talking you through the different fragrances, aromas and flavours that you may notice. She’ll encourage you to decide which flavour suits your taste; do you like coffee with a high acidity? Do you like fruity, floral or chocolatey aromas best? What is it that gives the coffee a particular flavour? In some Bogota coffee shops, you may even be lucky enough to be served by a national barista champion! The Coffee Shop Tour is a perfect activity to do with friends and family, especially for those who are visiting Colombia for the first time. At Café Cultor, the barista prepared us a Minga Caucana coffee, from the Cauca region of Colombia. The farm which produces this coffee used to grow the more lucrative crop coca (used to produce cocaine), so the café pays them more for the coffee than they would have received for coca, as an incentive for the farm to continue producing coffee. This tour has something for everyone, even if you’re not a coffee fanatic. In my case, I was delighted to discover early on in the tour that there are light coffees which taste a bit like tea! If you’re enthusiastic to learn more about coffee in Colombia, I encourage you to book your tour with Flavors of Bogota! Slurp and enjoy!